By J. Randolph Turpin Jr.
Live a life that is not of this world! Imagine being fully oriented toward a hopeful future. Imagine approaching everything from heaven’s point of view. Imagine being an agent of change sent by God to challenge the status quo. Such is the prophetic life. In nine succinct chapters, this book provides relevant guidance for the person desiring more than an ordinary, insignificant existence. The author introduces key practices of the prophetic life and addresses the challenges associated with this journey. This book also clarifies several misconceptions regarding living supernaturally. 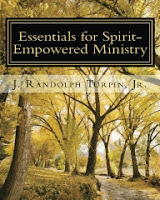 Essentials for Spirit-Empowered Ministry is a book that takes seriously Jesus' words when He said, "Very truly I tell you, whoever believes in me will do the works I have been doing, and they will do even greater things than these, because I am going to the Father" (John 14:12). What were the works of Jesus? As He proclaimed the Gospel of the kingdom, He healed the sick, worked miracles, raised the dead and cast out demons. If that is what He did, then that is what believers are to do as well. After Jesus ascended into heaven, He sent the Holy Spirit to empower His disciples to continue His supernatural works. Today the Holy Spirit is at work distributing to believers spiritual gifts, making it possible for Jesus' followers to receive revelation, prophesy, exercise unusual faith, heal the afflicted, work miracles, deliver the oppressed and raise the dead. This book is designed to equip God's people to do the greater works that Jesus promised they would do.